Tonight, I am stealing an event item. Tonight, I am going to prove you don’t need to hide or stealth to be a great thief. Sometimes, the best disguise is blending in. I shall take on the appearance of El DaNgel, Lord of Cow Town, and a person everyone knows is NOT a thief. Unfortunately for everyone, tonight he is me, and I am damn good thief. I am a damn good thief. Some call me the Babe Ruth of Theft. Let’s face it modesty isn’t my strong point and I’m not afraid to admit that I am the King of Thieves. I have no rivals. I have decided to begin chronicling this theft BEFORE I do it. Consider this me pointing into the stands calling my shots before I hit them. I decided to be extra careful tonight since I won’t have my usual evasive abilities. I’ve prepared two tactics. I’ve brought my invisibility ring and a decoy thief. The night began with a general warning about thieves attempting to steal from EM Helios. He then glanced at me. OOC: Now, I was being good taking screenshots but as I will explain, I basically got pretty pissed after completing my steal and just gave up, thinking the steal no longer counted. Let me recount the events. I robbed the mark of an event item called a cow pie, of a unique hue. I immediately sent it to bank with a bag of sending however I went gray in front of a rather larger audience that was very displeased. Everyone saw me gray and myself and the other members of the top 3 were teleported into the blackness outside the bounds of the normal world. We were given bland trophies of granite with inscriptions and the 1st place winner was given a cow pie AGAIN. What follows next is why i didn’t save all the screen shots. We were given generic engraved statues. EM Helios teleported us back into the ring. Some upset bystanders killed the diversion character, which I used for ::shock:: a diversion. I insisted the thief was that character because frankly, I didn’t care if it died, two thieves is too hard to control anyway. Some guy attacks El DaNgel, I produced a reminder that though a thief, I was still on a tamer mage and killed him with a super dragon in self defense. I checked the bank and it wasn’t there. I searched it several times to confirm. EM Helios had apparently removed the item from my bank box despite having completed a legitimate and righteous steal in Felucca. EM Helios dodged me and I was forced to seek a higher power. The Omnipotent Dark Lady Mesanna appeared from the abyss and explained the events of the evening. EM Helios did not and could not remove an item from my bank box. EM Helios could and DID delete the item by its ID thereby removing it from my possession. The Dark Lady expressed her admiration for this brother of the sticky fingers and showed favor upon the Lord of Cow Town. Fire rained from the skies and smoke flashed around us. The cow pie returned to its true owner, The King of Thieves. This is the story of my excellent theft gone totally wrong. For those of you who might wish to follow in my foot steps, remember, even the best plans may go awry. Evil Lord SMuRFY’s current score on Legends: 3 EM Event items stolen. 2 from players, 1 from the Infamous EM Helios. Note: Afterwards, 1st and 2nd place expressed their amazement at how fast I was able to steal the pie. Their admiration of my skills was totally warranted. 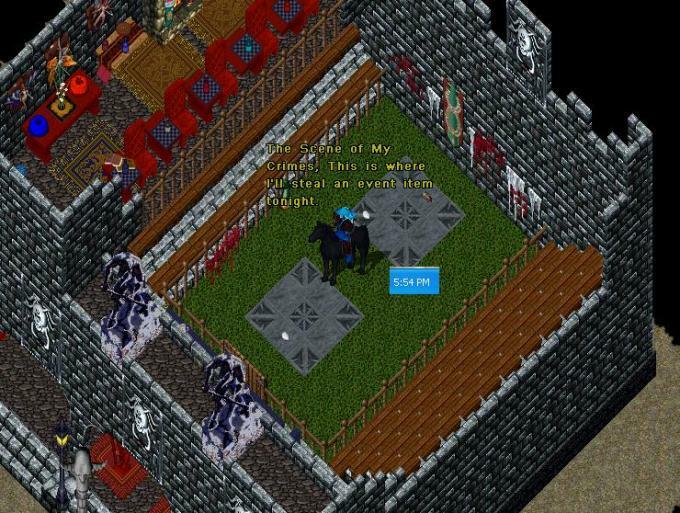 Lets be honest, I love fans and I love praise, so I sold their guild a castle in Cow Town on legends.